Wakening of the Phoenix Versus Rising of the Phoenix, Which's better? Wakening of the Phoenix, or Rising of the Phoenix? Wakening of the Phoenix has three targets and all of them are for you to engulf you in this poetic literary area and improve anything you are doing, literary, or in other art ways. home-biz-trends.com/wakening-of-the-phoenix.html - Wakening of the Phoenix: "I Call You Samba, I Call You A Field" by Sudanese poet, Sudanese journalist Khalid Mohammed Osman on doves. I hope one of them interests you. Giving the wakening to the Phoenix was the first name I have chosen for the first edition of my Arabic poetry book. But, sometimes, the word wakening is less impressing than rising. I want to read your opinion about this through the comments form near the end of the page. Yes, this is one item in the second goal. If languages is your talent, study, or profession, you are welcome to debate this, whether in a linguistic mode or not using the mentioned form below. "Poetry is your dreamy voice coming from underground world rising to the sky, whereby mythology travels from the geo_physical to the supernatural!" Poet Khalid Mohammed Osman. 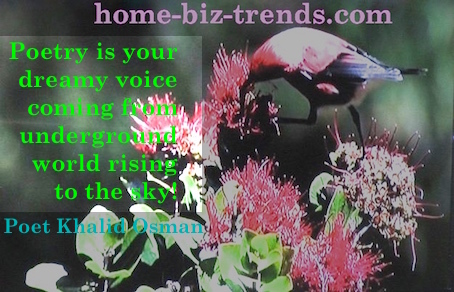 home-biz-trends.com/wakening-of-the-phoenix.html - Wakening of the Phoenix: "Poetry is Your Dreamy Voice" a quote by Sudanese poet, Sudanese journalist Khalid Mohammed Osman on real bird. Well, I started with the second target, which intends to get you involved in this literary area of knowledge for a good reason and that reason is indeed about you. I want you to be literary active and literary influenced to start, or share the discussion. The discussion is a productive mental environment to write your opinions about something. Your opinions simply make a book for me and others to read. Well, as this seems the third target, but we (you and I) haven't got at it, yet. You'll probably come through many English texture and Arabic texture (if you know Arabic) to do something about what you have read, or saw on the beautiful poetic images, which POSSIBLY could be A BOOK by you. 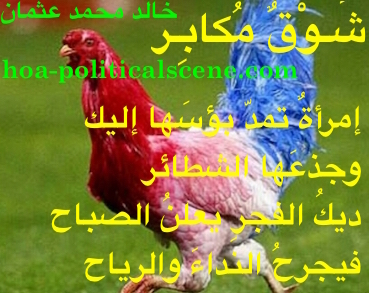 home-biz-trends.com/wakening-of-the-phoenix.html - Wakening of the Phoenix: "Arrogant Yearning" by Sudanese poet, Sudanese journalist Khalid Mohammed Osman on beautiful hen. The first target is clear. 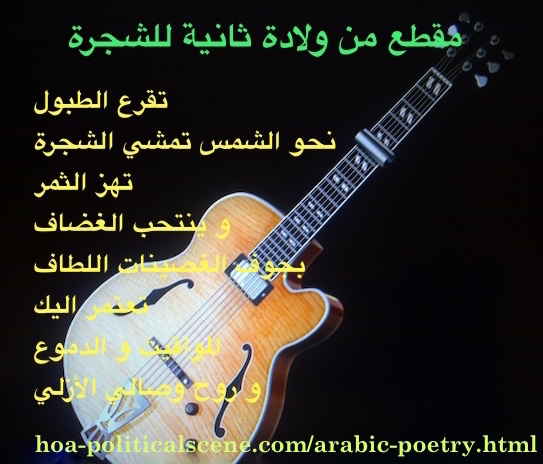 Perhaps, you read some couplets from Wakening of the Phoenix, here and at the Arabic Phoenix Poetry, Arabic Poems and the Phoenix Order, or on other Arabic platforms and social media with bilingual pages, such as Bilingual HOA Poetry. You got it too at HOAs English Poetry and some other pages at the sister platform. home-biz-trends.com/wakening-of-the-phoenix.html - Wakening of the Phoenix: "Rising of the Phoenix" by Sudanese poet, Sudanese journalist Khalid Mohammed Osman on Sudanese legendary singer Nancy Ajaj. The Versions of Wakening of the Phoenix! The first version of the poetry book is an electronic product (ebook). The second is the small collection book of poetry I published in Cairo, Egypt on 2010, as you can read and see at the Phoenix Order. Don't be confused. This has nothing to do with the Phoenix Order in Harry Potter's movies. The second selected poetry is more larger. You can get a copy of it through this page at Lulu. There is also a first version of a picture book at Apple iTune. 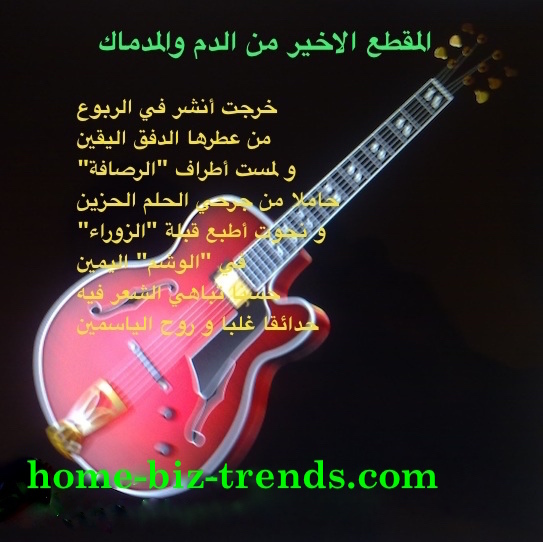 home-biz-trends.com/wakening-of-the-phoenix.html - Wakening of the Phoenix: "The Blood and the Course" by Sudanese poet, Sudanese journalist Khalid Mohammed Osman on guitar. Wakening of the Phoenix Debate! As, they call it the bird of fire, or the fire bird, the phoenix has always been inspirational to writers, poets and even painters. The book cover of the Wakening of the Phoenix, as you can see at the 3rd right column is a painting of the mythological bird by a Danish female artist (painter). I want to read your opinion about what you have already read above. If languages is your talent, study, or profession, you are welcome to debate this, whether in a linguistic mode or not using the form below. home-biz-trends.com/wakening-of-the-phoenix.html - Wakening of the Phoenix: "Second Birth of the Tree" by Sudanese poet, Sudanese journalist Khalid Mohammed Osman on guitar. The selected poetry you see here is extracted from the "Second Birth of the Tree", a second poetry book that takes levels of inventions to the philosophical existence of human beings. In additional, the political theme appears even through some sentimental couplets. Love has always been integral symbol of both the lover and the country (the homeland). Nationalism has on demand potential for new understanding to the theme of nationality at the time that the concept of "without boundaries" exists. The new understanding should pave the way to erase the policy of absenteeism religious military dictators and religious sectarian parties alike planned and are still planning to dominate power and wealth. This is a verse to struggle against the odds and create bright future for the nation to exist on the grounds of equality, justice, freedom and democracy. 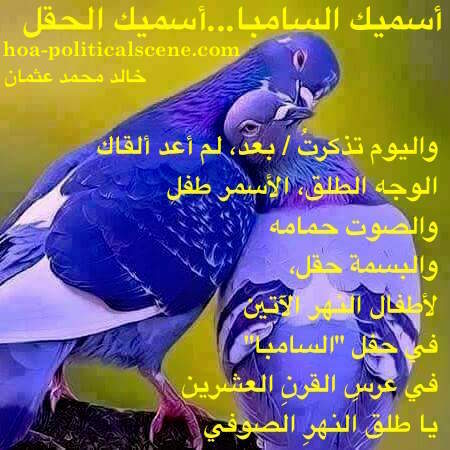 home-biz-trends.com/wakening-of-the-phoenix.html - Wakening of the Phoenix: "New Adam" by Sudanese poet, Sudanese journalist Khalid Mohammed Osman on Hollywood cinema star Mila Kunis. It integrates also with Sufism. The love spreads in the "Second Birth of the Tree" in love letters to Baghdad... before the destruction of the dreamy land of poets and artists. In the Arabic world, it has the same presence that Paris has in the European world. I have published some other books, as you see at the right column, including the "Political Tragedy of the Horn of Africa" and the short sentimental stories, "Love in the Internet Time". The political book is about the reasons and impacts of the Ethio-Eritrean wars and the other Ethiopian wars that different authorities has waged in the area to expand the political power and control wide areas. It criticizes the political elites, whether they are military dictators, emperors, or revolutionists through history for creating hard situations and destroying the peace and the integrity of the people in the Horn of Africa. The lessons learned from the unpleasant past should be a motive for nationals to come up with good policy of democracy, social justice, integrity and build regional relations with the same goals to integrate the people of the regional area. Read more at the HOA Political Scene Newsletter. home-biz-trends.com/wakening-of-the-phoenix.html - Wakening of the Phoenix: "Your Love is Beating Now" by Sudanese poet, Sudanese journalist Khalid Mohammed Osman on flowers bouquet. Interpreters wanted to translate some documents into English, French, German, Italian, Norwegian, Spanish and Swedish. ... And there are two targets here too. It is simple, use the form below. Provide in order: information about yourself, what your book is about, how many pages, the size of the book and then your contact information. Use the same form to contact me if you want to translate Wakening of the Phoenix into any language. Please provide good information about the translation project when you fill this form. Forward Wakening of the Phoenix e-book to your friends to buy and read it and support the Ezine Acts Multicultural Project. You can also use the Ezine Acts Language Translation form to submit translation quotes for others to request your translation services. I will connect you with them. If you liked Wakening of the Phoenix, please tweet to Twitter, pin the images, or share the page with your social media services. Thanks. Want to comment of Wakening of the Phoenix? Use the following comments form and receive useful ebooks to read when you submit your comment. Comments on Wakening of the Phoenix appear at the second section of the page above this line.